What is the connection between this picture and the news story below? Tillerwoman and I headed down to Newport yesterday. Not sure where to go we headed down to Fort Adams, home of the famous Laser Fleet 413. This is where I go Laser frostbiting in the winter, but I was curious to see what it was like at Fort Adams in the summer. There seemed to be a lot of people with the same idea as us. There must have been thousands of cars heading into Fort Adams so we parked in a field and headed down to the fort to see what was going on. There were a lot of tents around the fort and even inside it. We wandered into one tent and saw some folk taking pictures of a bottomless silver ewer. What was all that about? Why the fascination with a bottomless silver ewer? I mean, the thing is bottomless so you can't even drink margaritas out of it. Perhaps it was some bottomless silver ewer vendor from Newport promoting his wares? Anyway, since getting advice from Baydog to always carry my iPhone with me, even in the toilet, I snapped a photo of it too. 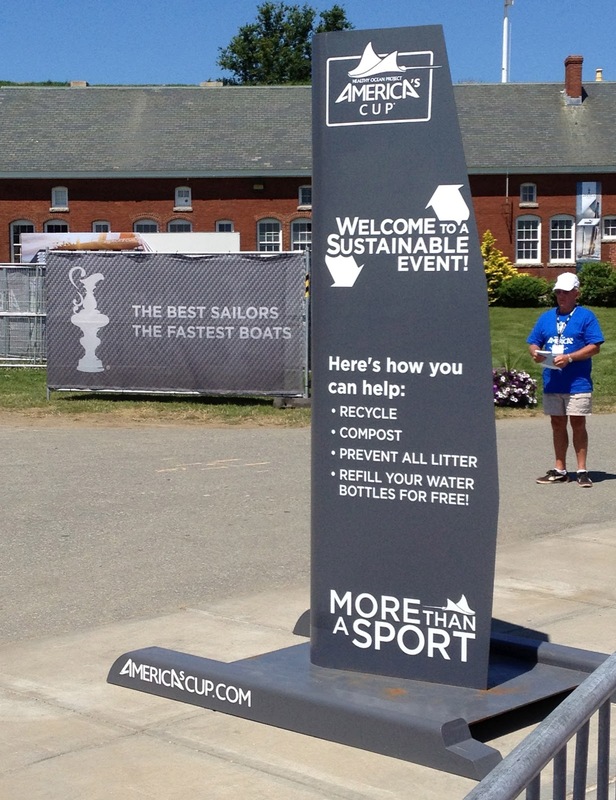 I was pleased to see that the folks at Fort Adams are very environmentally conscious. They were very keen on recycling and there were stations all over the place where you could fill your reusable water bottles with drinking water FOR FREE! Tillerwoman and I wandered inside the fort and were pleasantly surprised to see that there were more tents there selling various Rhode Island culinary delights. 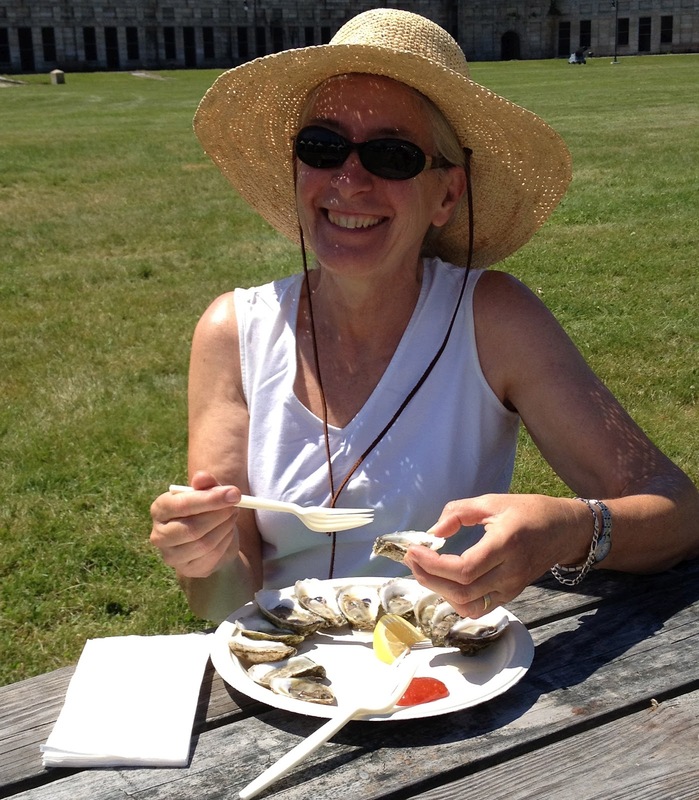 One of them was run by one of our favorite Rhode Island restaurants, the Matunuck Oyster Bar. 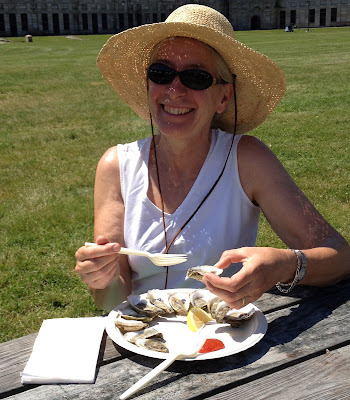 So we just had to share a dozen Matunuck oysters. Crisp and briny with a sweet finish. Mmmm! In search of more sustenance we discovered that Tallulah's Tacos had a stand in the fort too. Tallulah's on Thames is renowned as one of Newport's finest restaurants. 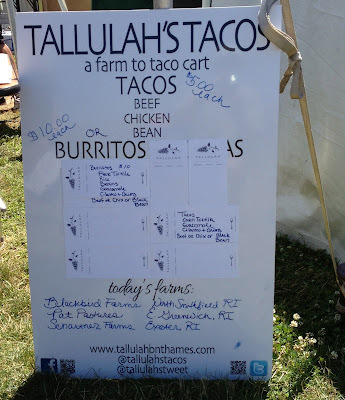 They recently launched a new venture, a Taco Truck selling Mexican style tacos and burritos using ingredients from local Rhode Island farmers. So we bought a couple of burritos and headed out of the fort and down to the shoreline of the East Passage of Narragansett Bay to enjoy a quiet picnic. Wow! It seemed like a lot of other people had had the same idea. There were crowds of people lining the shoreline, enjoying the weather, doing a bit of sunbathing, just hanging out. Although it seemed that some of them didn't understand English very well. Never mind. America is a nation of immigrants. 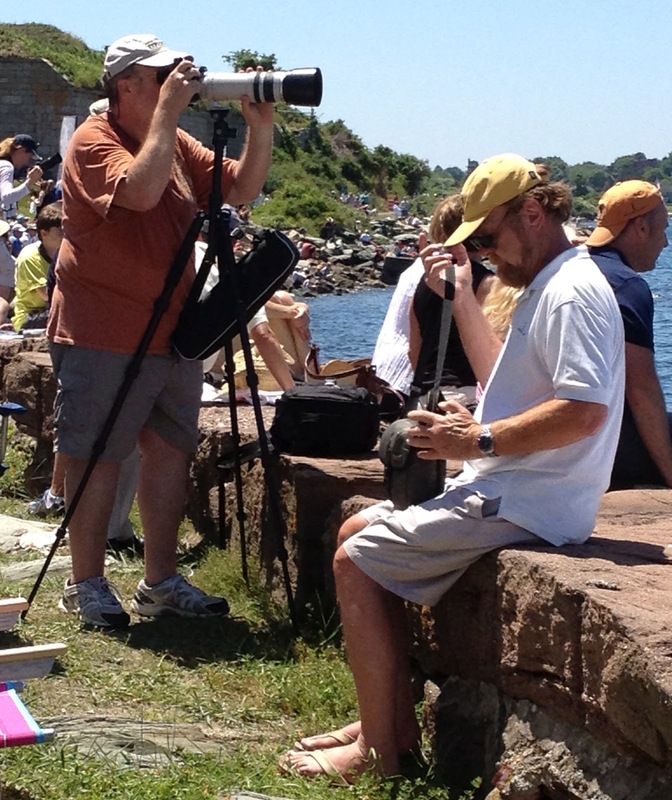 As I enjoyed my burrito, I noticed that a lot of the folk in the crowd had cameras and were pointing then across the water to Jamestown. I wonder what they were shooting? Anyway, as this blog seems to have morphed into a photography tips blog this month I thought I would snap a couple of shots of the photographers with their fancy cameras for your viewing pleasure. After a while some guys in catamarans came out and sailed around a bit and did some sort of informal racing on a ridiculously short course. I mean, we run longer races in Fleet 413. I was pleased to see that these guys could take time off from their day jobs to come and play at sailboat racing on a Thursday afternoon. They clearly had their priorities right. I was also pleased to see that all these recreational cat sailors were wearing helmets. They must have read the famous sailing blogger Yarg's post about Hard Hats. So, after a pleasant couple of hours watching the cat sailors having fun, Tillerwoman and I went home and watered our garden and had a chicken salad for dinner and watched the sunset. You thought this was a sailing blog? Whatever gave you that idea? You wanted pictures of cool boats? OK. OK. I like boats too. 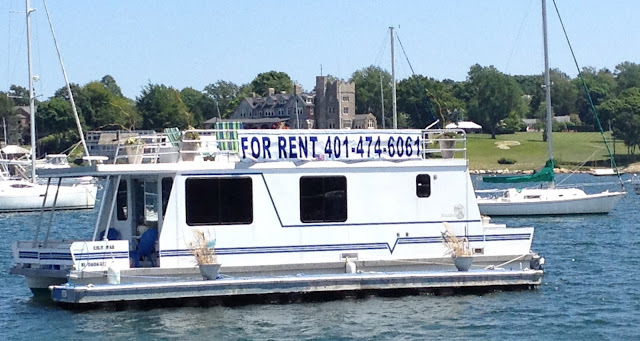 Here is a picture of a really cool boat I saw in Newport yesterday. Enjoy!! If you have other tips to pass on about how to create great photos on your blog then please feel free to write posts about them. 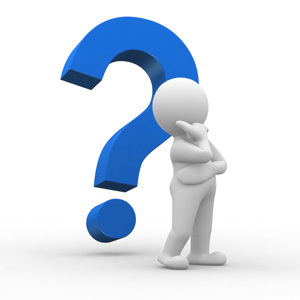 But I do have a specific question - or series of questions really - on this topic that I would like to hear more about. 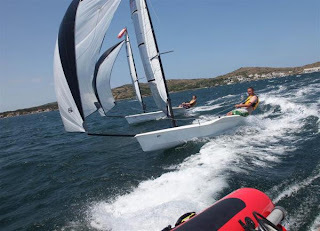 This is a sailing blog so I would like to hear what special tips you have for taking photos on a boat, and especially how you take photos on a small sailing dinghy like a Laser. Do you have a waterproof camera? What models of waterproof camera can you recommend? If you take a non-waterproof camera or phone on your boat how do you protect it? Do you mount your camera (still or video) on your boat? If so, how and where? One of my followers on Twitter specifically wanted some advice on where to mount a video camera on a Laser. Bow, stern, top of mast, end of boom, on your hat? What are the pros and cons of the different options? 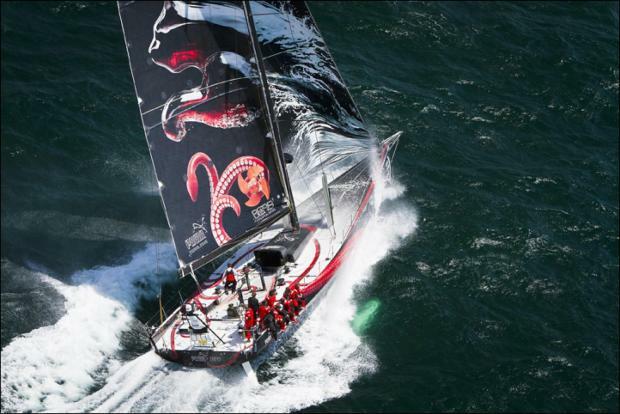 Are there any other tips on how to take great photos and video while you are sailing... or even racing? Doug at Improper Course wrote an excellent post Finding the Right Match that gives his answers to most of these questions. But I'm sure some of you do things differently. I'd love to hear from you. Post your tips on your blog and send me an email with a link to it. Full details at Photography for Bloggers 101. Thanks to all of you who responded to my request for tips on photography for bloggers this week. I think I counted 43 different tips. No, really. I did. Andrew of SadlerBootwerk says (in more words than usual) pictures tell the story. 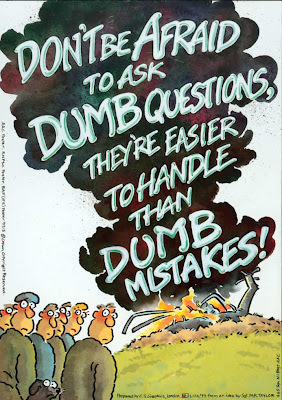 Tweezerman of Earwigoagin published 2 tips in one post - Don't sweat the small stuff... and CROP. And I'm not sure if Mike and Rebecca over at Zero to Cruising! intended to take part in this photo tips project but I'm going to include their post Step aside Canon D10 anyway. Meanwhile Mitch has been continuing his series of posts at Bone in Its Teeth. On Wednesday we had Let there be light with at least 7 tips about lighting, and the f-stop rules in which Mitch educated us about the role of aperture with another 5 or so tips. On Thursday our lesson was about Exposure with another 4 tips. And then on Saturday, Mitch gave us the intensive treatment with posts on Focal Length (at least 4 tips), Depth of field (4 more tips), a fascinating post on "culling" titled Don't bring out your dead which confirmed a suspicion I've long had about professional and really good amateur photographers (they take an enormous amount of shots and publish only a few of them) - I will count each step in Mitch's 5 step culling process as a separate tip - and then Mitch concluded his series with a post on Post-production which has at least another 10 tips if you count all the other great photography advice sites that Mitch recommends. Huge thanks to Mitch for putting all that effort into his amazing series of post with so much excellent advice about how to improve our photography skills. As he says in a comment to that last post, "Now go out and show us what you can do!" I look forward to reading more tips from you this week. Post your tip on your blog and send me an email with a link to it. Full details at Photography for Bloggers 101.
International Sailing Federation Technical Delegate Alastair Fox stated, "At Beijing 2008 we had 400 sailors from 62 nations and at London 2012 we will see 380 sailors representing 63 nations. This shows the spread of our sport that has occurred in the last four years." Spread? 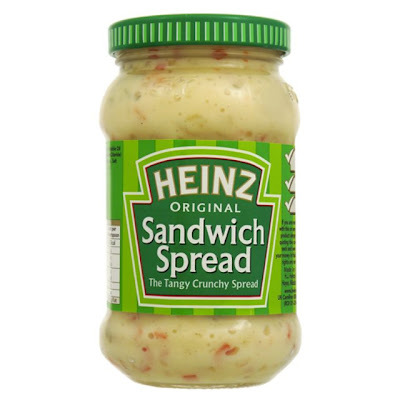 One more nation is "spread"? Only 529 days until the start of the Laser Masters Worlds 2013 which will be held in Oman from Dec 2 to 8. 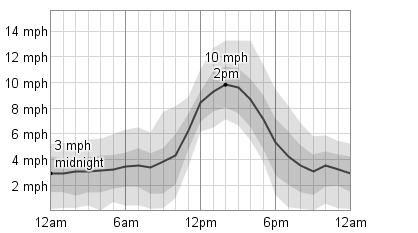 Average hourly wind speed (black line) with percentile bands (inner bands from 25th to 75th percentile, outer bands from 10th to 90th percentile). 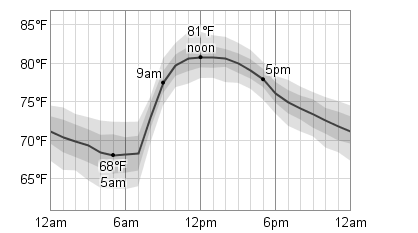 Average hourly temperature (black) with percentile bands (inner band from 25th to 75th percentile, outer band from 10th to 90th percentile). Above charts describe the typical weather at the Muscat International Airport (Muscat, Oman) weather station over the course of an average December 2. They are based on the historical records from 1974 to 2011. Source WeatherSpark. Thanks to everyone who responded to my request for tips on photography for bloggers, especially watery bloggers. I think I counted 52 different tips, perhaps more. Amazing! Joe Rouse says, You don't need to over saturate the colours of your photos. Muted can be just fine. And Joe also says, You can transform a less than successful photo with software and make it semi-interesting. JP says, Most old towns look even better with a couple of tall ships moored in the harbor. On Tuesday last week I posed some questions to my readers about the advantages of a more sophisticated camera such as a DSLR over a simple point-and-shoot camera or even a camera phone. JP responded quickly with an interesting example as to why sometimes a DSLR is better than an iPhone and then followed up on Wednesday with 9 more thoughts on the issue in More on photography. Baydog gave us a Second Opinion on photography with a photo essay illustrating his tip Don't be afraid to look like a photo-blogging geek. If you want some good shots, you have to be nosy sometimes. Last Wednesday in accessorize, accessorize he had 5 tips for us on topics such as filters, lens hoods, strobes and tripods. Then on Thursday he addressed Composition. And today he educated us on Subject Matter. Actually pretty much every post on Mitch's blog is an education on photography. Superb image after superb image! Doug at Improper Course addressed a topic in Finding the Right Match which I had hoped somebody would cover: how the hell do you take photos and video while sailing a Laser? He addresses which cameras he uses, how he likes to mount them (on his hat! ), how to tack with a camera on your hat, how not to drown yourself when your camera tether gets tangled in a line under the boat when you capsize, and how to edit the video. Great stuff! Following the advice from Baydog (always carry your iPhone with you even in the toilet) I snapped this shot of the "throwing rocks in the ocean" action. This is what I do when I'm not sailing. Or blogging about not sailing. Tomorrow I hope to be sailing on another lake in Massachusetts, not very far from this one. Then I can blog about sailing. 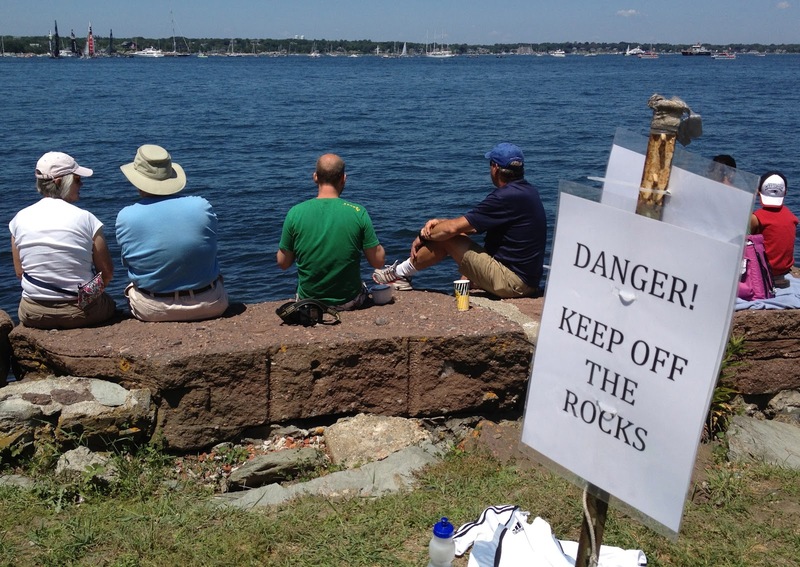 It's very common at major sailing regattas these days to have trapezoid courses. The above diagrams should make it clear what trapezoid courses are. 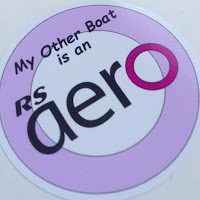 If you don't even understand the diagrams then you will probably sympathize even more with the views expressed in the guest post below by Susie Pegel - a REAL Laser sailor. 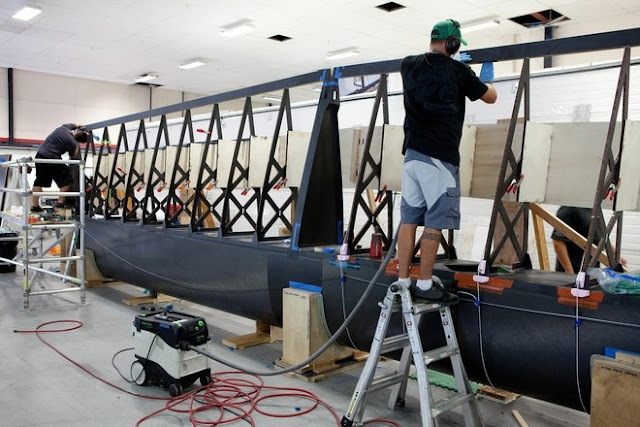 Not too long ago, Torben Grael wrote a commentary saying that a lot of things invented in recent years "by some clever person" to change the ways things are done in modern sailboat racing, new course configurations, new ways of scoring races, etc. are essentially a bunch of B.S. They have not changed things for the better. 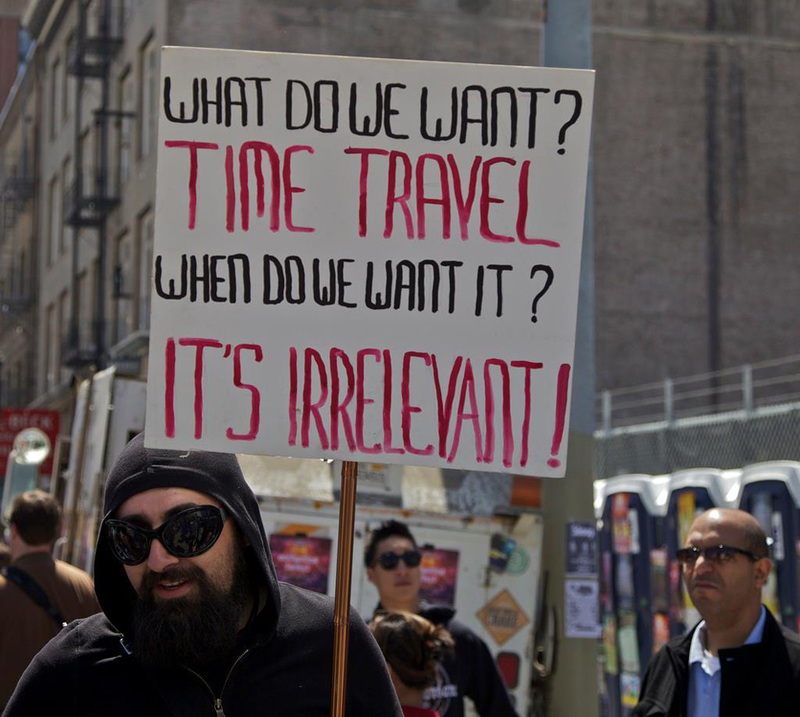 Being the old-school type of person I am, I had to agree with him. 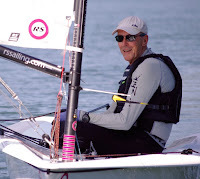 I think Torben currently has a daughter sailing women's 470 for Brazil, so I'm sure he is seeing the way things are run these days and comparing them to the way things used to be during his sailing campaigns. The trapezoid is a classic example. It takes a small army of people to set a trapezoid. If the wind shifts, it is impossible to adjust a trapezoid. 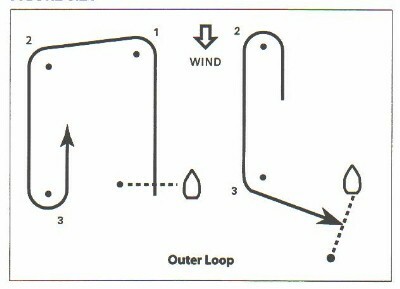 The trapezoid changes the nature of the sport and race itself, since you spend most of the race reaching and going downwind and very little time sailing upwind. I guess finishing at the top of the beat has become a thing of the past. I can tell you from personal experience (Laser championships held in recent years at Hyannis and Buffalo) that the various "fleets" still get all tangled up together on the trapezoid, making the race almost impossible to score since you now have to untangle not only who beat who across the finish line, but what "fleet" they were in. At Hyannis, at least the 4.7s were on a separate race course. But the Radials and full-rigs were on the same trapezoid, and I know from personal experience that one full-rig group ended up tangled up with another full-rig group. 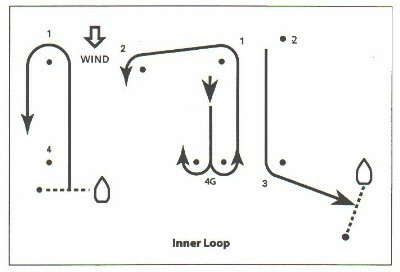 At Buffalo, the full-rigs, Radials and 4.7s were all on the same trapezoid (the 4.7s had a shorter beat). I know from personal experience that one full-rig group ended up tangled up with another full-rig group. Result: I think at both Hyannis and Buffalo the sailors were frustrated, the locals trying to run the regatta were frustrated, everyone was frustrated. 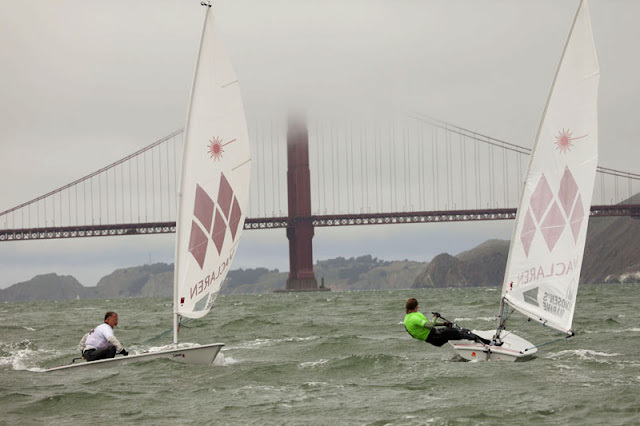 I think the Laser class should do a follow-up with the host club asking them what they think should be done to improve the running of a Laser class championship regatta. I'm sure they would have plenty of ideas based on their own experiences trying to do it. Just having separate courses would improve the quality of the racing for the competitors and make life simpler for those trying to run the regatta. Since we all seem to be into "surveys" these days, here is a unique idea: instead of surveying the people AT the Laser Masters Worlds what they like about it (which is probably everything otherwise they wouldn't be there), how about surveying people who AREN'T at the Laser Masters Worlds what they don't like about it that is keeping them from coming. If the Laser Masters Worlds is in North America, I would like to see it made not as time-consuming as possible and not as expensive as possible so as many North American sailors as possible feel they can participate without going bankrupt in the process. Just because "some clever person" invented all these ideas of how modern sailboat races should be run, doesn't mean they are good ideas. "Some clever person" also thought the stand-your-ground law was a good idea too. Some of these things need to be revisited and an honest assessment made of just how wonderful they are. It's that time of year again. It's Father's Day on Sunday. So, just in case you happen to know a father who sails a Laser, here are some gift suggestions. 1. An island in the Grenadines. The Grenadines is one of the best sailing areas in the world. 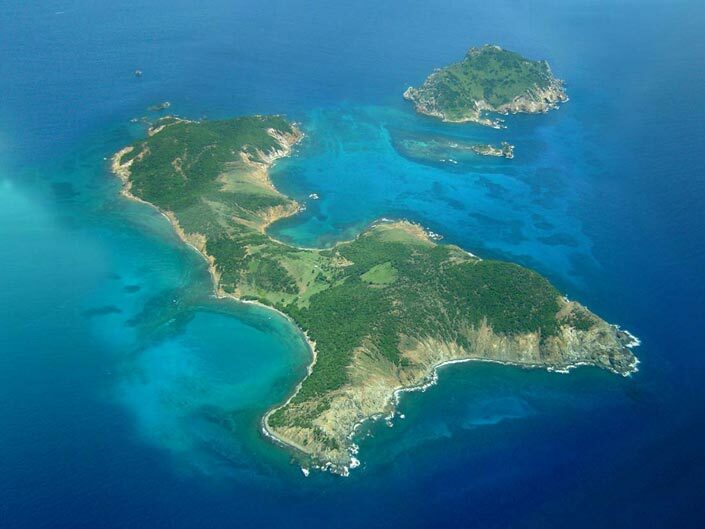 What better to buy your sailing Dad than his very own island sailing base in the Grenadines? I see that Baliceaux Island is up for sale. Located just five miles from Mustique and Bequia, this gentle oasis is approximately 320 acres and is uninhabited and unspoiled. Look upon it as an investment for the future of the whole family. And your Dad will really appreciate being able sail his Laser off those pristine beaches. I hear that after the Volvo Ocean Race is over, PUMA Ocean Racing plans to put Mar Mostro up for sale. What a great present for Dad! He could take the whole family out sailing on this. He could even take all his grandkids to Europe every summer. On a VO70! What a great gift for all the family. It's just a big Laser, really. What's that you say? You think those are a bit expensive for Father's Day gifts? Maybe you plan to surprise him with one of those for his birthday instead? You know your Dad will have fun in an RS100. Much more fun than that boring old Laser he has now. This is a boat designed THIS century. It has a spinnaker. It's faster than a Laser. It's more fun than a Laser downwind. 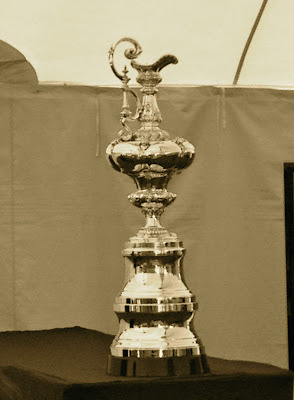 And it was Sailing World's Boat of the Year in 2011. The only problem is that there probably aren't many of them around yet where your Dad lives so you had probably better buy six of them so that he can invite all his friends over and do some racing with them. Maybe he'll even let you play with one? What? Still too pricey you say? If you just want to buy your father a small token gift for Father's Day this year, you could always buy him a new Laser. I'm sure he would appreciate it. Really. It's the thought that counts. You can always buy him an island next year. Stuff wears out. Stuff breaks. You don't really appreciate this when you are young. You think that the new camera your parents gave you for your 21st birthday will last for ever. You think your first car will keep on running and running. You feel immortal and think that nothing can hurt you or break you. You think that you will keep on running and running. As you get older you get wiser. You learn that stuff wears out, stuff breaks. Even yourself. Especially yourself. About a month ago I hurt my back. It might have been from too much running. It might have been from trying to race Peter Seidenberg in 30 knots of wind on a Tuesday night in Bristol. But the real pain came on when I was sitting at my desk. I hurt my back by sitting for too long probably. A blogging injury. It was totally incapacitating for a while. I lay on the floor for several hours and couldn't move. Later I crawled painfully into bed and lay there all night dreading the inevitable time when I would have to stagger to the bathroom because I knew it would hurt so much. No running for a month. No sailing for a month. Gradually, slowly, with lots of stretching and heat treatments, my back started to get better. I tried doing a few gentle sit-ups. OK. I did more exercises. I progressed to working out on the hiking bench. My back survived. So yesterday I decided that it was time to try sailing my Laser. Just a gentle sail by myself to test out my back. Would it be OK? I found all my sailing gear. I packed it all in the car. I hooked up the trailer. I drove over to Bristol. I lifted my boat off the road trailer on to the dolly. My back was OK. I rigged the Laser, including doing the standard "hold the rig as if you were tossing the caber" maneuver. My back was OK. I changed into my sailing gear. I started wheeling the Laser down to the water. SNAP. Something broke. Not my back this time. The Laser tipped over sideways at a weird angle. The axle bracket on one side of my dolly had broken. I said a bad word. 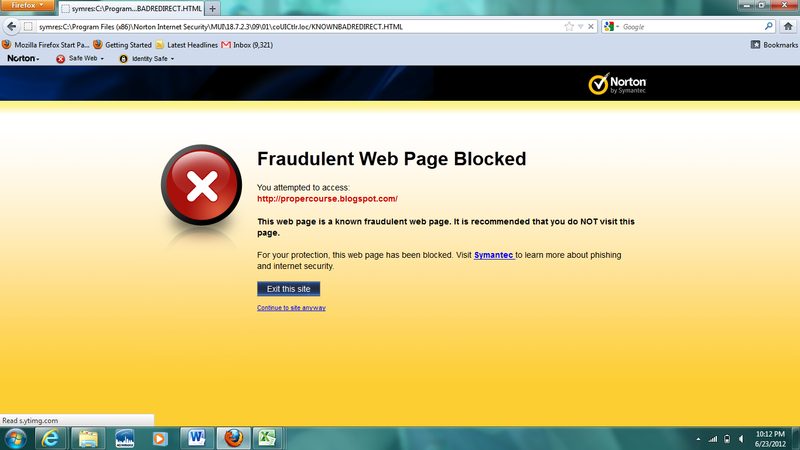 All that effort and I wasn't going to be able to go sailing. I changed out of my sailing gear. I lifted the boat off the dolly on to the road trailer. I had my iPhone with me. Of course. As advised by my friend Baydog, I carry it with me all the time now. Even in the toilet. So I took a photo of my dolly. My dolly doesn't usually look like that. I loaded the broken dolly into the back of my car. I told my wife what had happened. Ever one to see the positive side of life she commented that at least I know now that I can lift my boat off the trailer and rig my boat without doing my back in again. I called up the nice man at Laser Performance Sail + Sport RI and confirmed he had a Laser dolly axle bracket in stock. I drove over to Laser Performance Sail + Sport RI and bought a new axle bracket. I drove home. I fitted the new bracket. No big deal. The dolly, like the boat, is 17 years old and has had a lot of rough treatment over the years. My back is almost 64 years old and has also had a lot of rough treatment over the years. This may be a dumb question. But then I am pretty dumb about the subject of photography. Our Photography for Bloggers 101 group writing project got off to a roaring start last week with many helpful suggestions and tips. Several of the contributors made the point that you don't need a fancy, expensive camera to take good shots for blogs. "Any old thing will do," wrote one of you. A simple point and shoot digital camera or an iPhone can take great pictures for your blog. The important thing is to always have it with you and have it ready to go into action. OK. I get it. I really do. But I also know that many of the bloggers whose photography I admire also do use more sophisticated cameras at times. Something with a "supermodel body" as one of you called it, and a variety of interchangeable lenses. So, my dumb question is, "Why?" What can you do with your fancy camera with three different lenses that you can't do with an iPhone? What kind of shots can you take with it that would be impossible to capture with a simple point and shoot camera? Are there some kinds of photos where the fancy camera delivers far superior quality than a camera phone would, and if so what kinds of photos, and exactly how is the quality better? Sorry if that's a dumb question. I suspect the answers are obvious to those of you who have fancy cameras. So please explain for us photographic novices. It would be great if you could illustrate your answers with photos showing how the more sophisticated camera does things that my iPhone can't. You don't need to write an essay (unless you want to.) A tip explained in a couple of sentences and a photo or two to illustrate it will be fine. Post your tip (or essay) on your blog and send me an email with a link to it. Full details at Photography for Bloggers 101. What a very English scene! A steam engine hauling some coaches in Great Western Railway livery along a line running past a small lake. Wait. There are some Lasers on that lake. There must be a sailing club there. Indeed there is. Trimpley Sailing Club. According to their website, the main boats they sail are GP14s, Lasers, Toppers and Optimists. As far as I can see from Google Maps, the lake on which they sail, Trimpley Reservoir, is barely half a mile long. How totally English! England is dotted all over with dinghy clubs like that. Six years ago, I wrote about a very similar club, my own first sailing club, Taplow Lake Sailing Club. A few years ago, a young girl called Alison learned to sail with her Dad in a GP14 at Trimpley. She then started sailing an Optimist and after a short stint in the Topper she switched to the Laser Radial when she was 15. Alison has been training hard and competing locally, nationally and internationally in the Radial for the last 10 years. 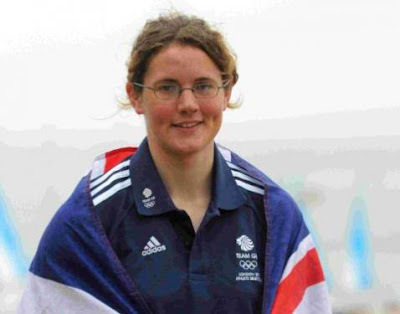 All her hard work paid off a few weeks ago when Alison Young was selected to be the British sailor in the Laser Radial class at the Olympics this year. Then, last week, she went out and won the gold medal at Skandia Sail for Gold, sailed at Weymouth, where the Olympics will be held in a few weeks, and in the process beating all the top Olympic contenders from other nations. Now folks in the know are talking about Alison as having a real prospect at winning an Olympic medal, maybe even the gold. Bravo to Trimpley Sailing Club! Forget the family Windsor. Forget "Sir" Elton John. Forget the English football team. They all leave me cold. It's places like Trimpley Sailing Club and people like Alison Young that make me proud to be English. When I went to Eastside Wines in South Boston (under the pretext of visiting the New England Boat Show) back in February I was impressed not only with their wine selection but also with their offerings of local rum and beer. Confession #1. I did not know before that there was such a thing as Massachusetts distilled rum. Confession #2. Wine, beer and rum. I don't think I would mind too much if the only alcoholic beverages ever invented were wine, beer and rum. Where was I? Where am I? Oh yes. Eastside Wines. After selecting a few bottles of wine on that momentous day back in February, I also felt the overwhelming urge to buy a few samples of the beers available. One of the beers I bought was a 1 pt. 6 oz. bottle of Pretty Things Babayaga Sylvan Stout. It's an autumn seasonal beer, but today seemed like a perfect day to enjoy it with a Cornish Pasty for lunch, sitting in the sunshine at our ancient barbecue table enjoying the view of Mount Hope Bay. There's a lot of good things that come from Massachusetts. 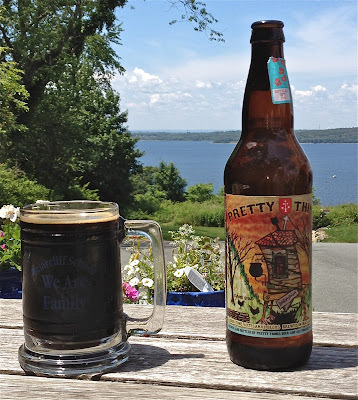 Pretty Things Babayaga Sylvan Stout is one of them. PS. Yes the inscription on my beer glass really does read, "Briarcliff School. We Are Family." Apparently my sons' middle school in New Jersey thought that beer glasses were appropriate gifts to present to students when they graduated from aforementioned middle school. It probably explains a lot of what happened in the next decade or so. PPS. I think I'll take a nap now. Several people commented on yesterday's post, remarking on the beautiful view we enjoy of Mount Hope Bay from the Tillercottage. "You are truly blessed to sail on those waters," said one. And the camera does not lie. Our view of Mount Hope Bay is indeed scenic and beautiful. We see the northernmost tip of Portsmouth and the eastern slopes of Bristol and Warren, all picturesque Rhode Island towns. But if you sail on Mount Hope Bay, you will see something that is not quite so picturesque dominating the northern end of the bay. A couple of weekends ago, three of the Tiller Extensions (my grandchildren) were staying with us. One misty morning the two eldest ones, Emily and Aidan, wanted to walk with me down to the beach in front of our house. I looked up towards the north end of Mount Hope Bay and snapped the photo above. As you can see, the beach is rocky. Many of those rocks in the picture are covered at high tide. Even if I could get my Laser down to the beach (which I can't), even if I kept my Laser on the beach (which I don't), this would not be a great place to launch a Laser. The kids went searching for sea-shells and tiny crabs. What's that monstrosity you can see through the mists in the picture? That is Brayton Point Power Station. Wherever you sail on Mount Hope Bay it dominates the view. Thankfully it is almost totally hidden by trees from where the Tillercottage is situated. It's frigging huge. Just to give you a sense of scale, the power station is almost 4 miles from where I took the photo. Those cooling towers are 500 feet tall. They are 70 feet taller than Providence’s tallest skyscraper. Brayton Point Power Station produces more carbon dioxide than any other source in New England and New York — almost 5.9 million metric tons of greenhouse gases in 2010 and 2011, almost entirely carbon dioxide, with smaller amounts of nitrous oxide and methane. The power station burns coal, natural gas and oil - but mainly coal. Mount Hope Bay does have beautiful views. If you don't look to the north. We residents of Rhode Island have a name for that ugly area at the northern end of our bay. Tillerwoman always wanted a view. When we were house-hunting back in 2007, one of her requirements was a view. We didn't realistically expect to find a house that satisfied all of our other requirements and also had a view quite as good as the one we ended up with. We got lucky. The residents and guests at the Tillercottage enjoy a wide panoramic view to the west across Mount Hope Bay. And sunsets to die for. Actually it may not really be west. More on this later. We've never lived in a house before that had such an uninterrupted view of the western horizon. Once you start watching the sunsets every evening, you start to appreciate why those ancient dudes who built Stonehenge (and all the other "henges") were so interested in how the position of the setting and rising sun changes with the seasons. I kind of knew the theory in an intellectual way before, but you never really feel it in your guts until you have watched the sunsets every day for a year or so. We moved into the house in late May and for the next few weeks of summer watched the sun set almost directly in front of the house, over the small hill in Bristol known as Mount Hope. Then as the season changed to autumn and winter, the sunsets moved to the south (the left) until they eventually disappeared behind those trees in the top photo. We could still see the sunsets if we walked up the road a bit, only now the setting sun was over Mount Hope Bridge and the Eastern Passage of Narragansett Bay. As spring came in 2008, the sunsets reappeared into view and moved further and further to the right very day. I started thinking about exactly what compass bearing the sunsets would be at different times of the year. I guess I had never really internalized the fact that the sunsets would be due west at the time of the equinoxes. I consulted a chart and realized that, by some fortuitous coincidence, our house was due east of the northernmost tip of Aquidneck Island. (Newport is at the southern end of the that island.) That northern tip, known as Common Fence Point, can be seen as that narrow spit of land poking out of the trees on the left of the top photo. Sure enough, around March 21 the sun set over that point of land. So our house doesn't really face west. It faces somewhat north of west. Right in front of us, poking up over Mount Hope, is a water tower which is situated somewhere in the town of Bristol. It's roundish. 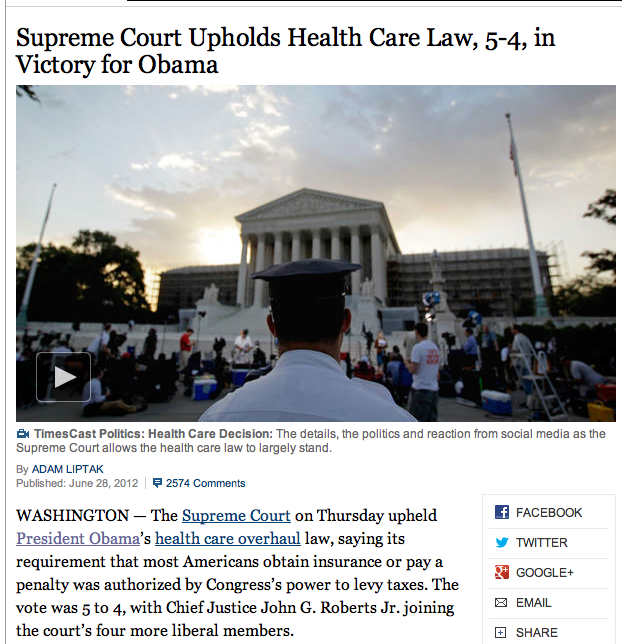 We took to referring to it as "the ball." And we started tracking the sunset's progress relative to the ball. "It's way to the left of the ball this week." "It's getting closer to the ball." "I think it will set just left of the ball tonight." Last week, on the last day of May, I took the photo below of the sunset. You can see "the ball." The sunset is now to the right of the ball. I've been blogging for over seven years but I am constantly humbled by the superior skills of so many other bloggers in the art of creating marvelous photos and videos for their blogs. 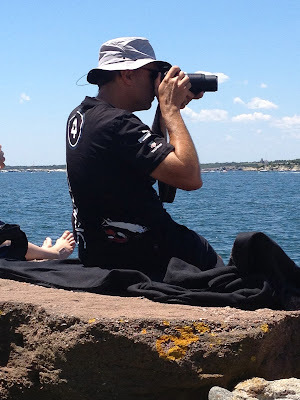 Every day I see on your blogs wonderful pictures of boats, and people having fun on boats, waterscapes, sunsets, knitting, fishes, ladies in bikinis, the night sky, ladies in lacrosse gear, food, seagulls, flowers, chickens, ladybugs, portaloos etc. etc. Some of you seem to have mastered the art of taking great photos from small boats like kayaks and sailing dinghies, and I see one of you is even taking photos while racing in a Laser regatta! Amazing! How do you do it? So this month I would like you to give me some tips on photography for bloggers - especially watery bloggers. I propose we run it like one of our regular group writing projects. Write a post on your blog about a tip on any aspect of Photography for Bloggers. Once you've posted your tip, let me know about it by emailing me a link to your post. Choose a unique title for your post that summarizes your advice please. At the end of each week I will publish a post with links to all the new entries in the project. Then at the end of June I will publish a summary post with links to all of your tips about Photography for Bloggers, probably organized by major topics so that it will be a useful reference source for anyone interested in learning about this subject. You could write about what equipment you use, how you select subjects, how you compose photos, lighting, all that technical stuff like aperture and exposure and focal length and depth of focus, or how you edit and manipulate the photos or videos before you publish them, what software you use, whatever. Any aspect of Photographer for Bloggers that you think would be helpful to me and other novices. I hope you will include some examples of your own photos to illustrate your posts. If you have several tips to pass on, by all means write several posts. The more the merrier. Maybe we can break some kind of record? I may well write some "prompt" posts during the month suggesting particular questions on which I need help in creating photographs for my blog. But, for now, just write a post telling us what single tip you think is most important for a novice wanting to get into Photography for Bloggers. Then email me a link to your post. One exciting night of Laser sailing on Lake Michigan. Filmed with a GoPro Hero HD, and edited with iMovie. Kate Hayes is the daughter of Nicholas Hayes, the author of Saving Sailing, who emailed me the link to this hilarious video. I was somewhat puzzled to see a Laser launched from a hoist but apparently there is no ramp at this site. Seriously. Laser sailing is fun. Sometimes. Really.